Through analysis of source material, the artist’s creative process and new archival resources, this In Focus investigates new interpretations for this pivotal painting’s reception in Paris at a time of artistic and political turbulence. 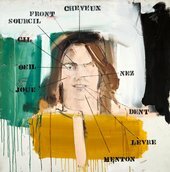 Parts of the Face: French Vocabulary Lesson 1961 is an oil painting on canvas by the American artist Larry Rivers. It is a portrait of his young wife, Clarice Rivers, with the features of her face labelled in French, such that the painting as a whole resembles an educational diagram. It was created during a stay in Paris in the winter of 1961–2 and shown in London in May 1962, when it was acquired by Tate. This In Focus shows how the painting playfully thwarts the codes of portraiture, as well as reassessing its place in the artist’s career and its theoretical implications within the ‘linguistic turn’ of art in the 1960s. The project examines Rivers’s position within a network of different styles, mediums, creative locales and across generations of artists, and considers the significant insights that the history of Parts of the Face offers into French-American artistic relations of the period. Published in October 2016, the project is authored by Dr Sophie Cras (Université Paris 1 Panthéon-Sorbonne) and has contributions by Nicholas Martin (New York University) and Dr Christopher Penfield (Purdue University).